Initial HE Shell Velocity814 m./s. Initial AP Shell Velocity814 m./s. 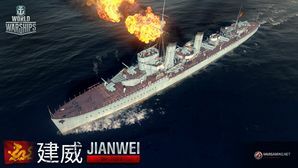 Jianwei — Pan-Asian Tier V destroyer. Developed in Britain, the design of this destroyer flotilla leader was offered to the Government of the Republic of China in 1929 (Project T.306), but it never materialized. The ship carried five main guns and two triple torpedo launchers. Compared to the competition, Tier V's Jianwei doesn't have a lot to recommend it. She lacks a strong suit: Japanese and German destroyers Mutsuki, Minekaze, and T-22 have the best torpedoes and among lowest detection of Tier V destroyers; Russian destroyer Podvoisky has the fastest speed of Tier V ships (a ridiculous 42 knots unbuffed), and American destroyer Nicholas has the best survivability and main battery firepower of the tier. What Jianwei has instead is an odd mix of Podvoisky’s slow main battery reload and decent health pool, torpedo range equivalent to a Mutsuki that has the Torpedo Acceleration skill, and main battery firing range, speed, and detection similar to Nicholas. Subsequently, it finds a niche at Tier V as a well-rounded ship; a jack-of-all-trades, master of none. This leaves captains free to decide what they want to focus on making the ship to be through mounting upgrades & selecting various commander skills that will enhance her in various ways. Good main battery firing range. Decent torpedo damage and reload time. Fast rudder shift time and small turning circle - manueverable enough to evade incoming artillery. Decent concealment - can sufficiently ambush enemy ships. Poor main battery reload time - difficult to fight / contest other destroyers. Short ranged torpedoes - cannot torpedo enemies without a high risk of being detected and will struggle against ships sailing away. Deepwater torpedoes means that it cannot efficiently fight enemy destroyers in close range combat. Hull: Upgrade to Hull (B) for more health, improved rudder shift time, and a minor uptick in AA. Research of this module unlocks progression to Fushun. Torpedoes: The torpedo upgrade doesn't provide more range, but does provide a LOT more punch out of Jianwei’s torpedoes at the cost of reload time. Gun Fire Control System: Upgrade to Mk V mod. 2 for an extra 10% range on the main battery. Most destroyer captains will benefit the most from the larger health pool offered by Hull (B); spend early experience gains there. Captains are advised to invest in whichever of the armament buffs — either the improved torpedoes or the main battery range increase — best fits their play style in the ship. India X-Ray ( ) and Victor Lima ( ) are recommended for players choosing main batteries as their primary weapon for dealing damage or in conjunction with their torpedoes. Juliet Whiskey Unaone ( ) is not recommended due to the torpedoes already having a high chance of causing flooding. Juliet Charlie ( ) is left to the player's discretion as to whether to they feel that Jianwei detonates easily. Equal Speed Charlie London ( ), Zulu Hotel ( ), and Dragon Flag ( ) are recommended for faster captain (re)training. This page was last modified on 26 May 2018, at 01:16.